Today we finally see the release of the Dynamite Entertainment James Bond comic VARGR. It was first set to be released on April 6 but was postponed to April 20. As I have written before this seems to be quite common in the comics industry. Why Dynamite Entertainment dont wait three extra months to release the comics so they can be certain that they can deliver on the advertised release date is for me a question. I believe the answer is that the work they order needs to be cashed in as soon as possible. No money should ever sit and wait. I just dont think this is the way to treat loyal customers or people working with the comic. What if Eon Productions failed to deliver a James Bond film on time? I work daily with sales of films and we do have the same issue in our industry. But when a date is set the industry make sure to deliver the film on time. Anyhow I am so glad that during the weekend I can sit down with my complete set of VARGR comics and read them for the first time. I have waited to read the story until I had all comics and it do look so great. I absolutely love the drawing above by Jason Masters. Its like he has captured a younger Bond then normal but still very though. Somewhere around 28 years old instead of the regular 35-40 years old. 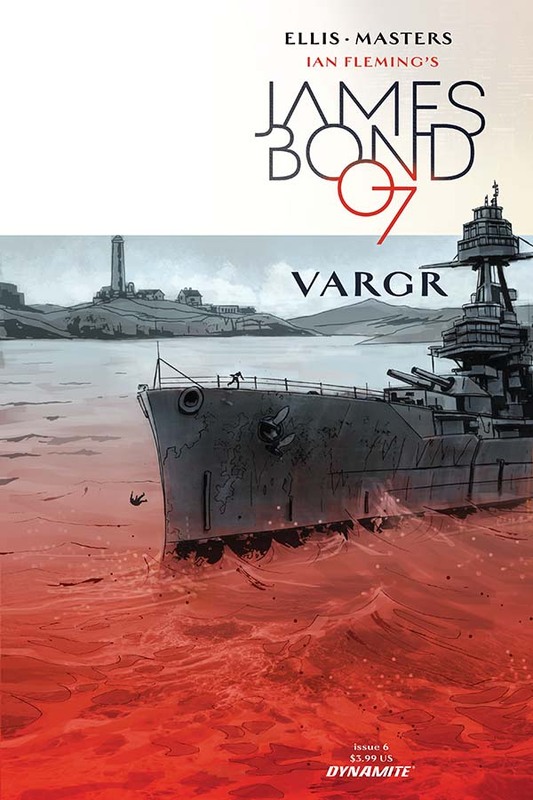 During March Dynamite Entertainment sold a little more then 15 000 copies of VARGR taking the comic to the #126 on the comic charts in the US. I am happy to mention that both Warren Ellis and Jason Masters have received renewed confidence and will release a new James Bond story called EIDOLON and set (at this point) to be released on June 15. Below you can find a short synopsis about the story that includes SPECTRE. After World War Two, army intelligence groups created ghost cells called "stay-behinds" across Europe in the event of a Warsaw Pact surge. "EIDOLON" is the story of a SPECTRE stay-behind structure - ghost cells of SPECTRE loyalists acting as sleepers until the time is right for a SPECTRE reformation and resurgence. The time is now.